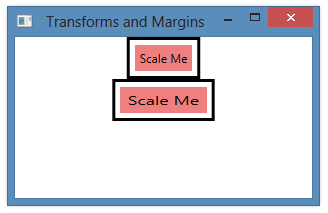 When you apply a 2D transform to a user interface element, the transform impacts only the element and everything inside of the element. It therefore does not change the element’s margins. In the example below, we have a Label element that has a margin of 5 separating it from its parent Border. Notice that when we scale the second instance of the Label, it still retains the same margin.